Fancy a bit of seafood? 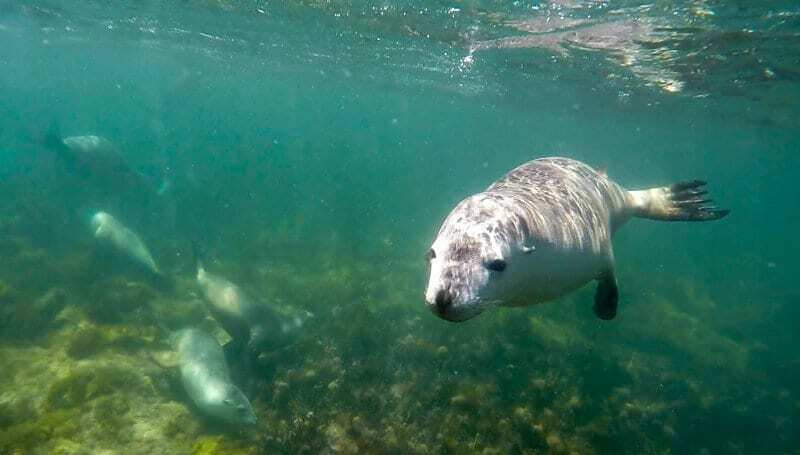 Keen to play in the underwater world with seals and sharks? What about spectacular rugged coastlines and pristine beaches with nary a soul to be found? In a nutshell, or should I say oyster shell, this is the Eyre Peninsula. 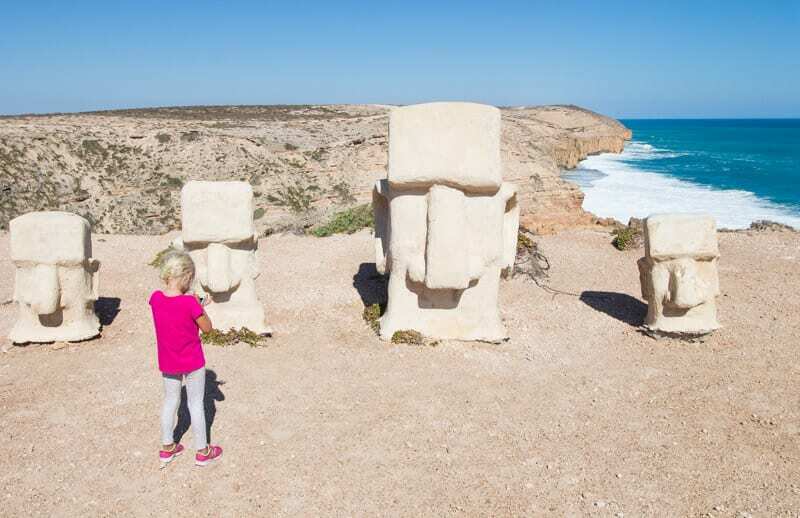 We’ve been keen to explore this region of South Australia ever since our mates, Em and Nick from The Blockshop told us it was one of their favourite regions in Australia. They were a couple of weeks ahead of us on our Australian road trip and reported back that we could not miss Coffin Bay and the surrounds. Sadly, we did due to exhaustion and cutting our road trip short. Eyre Peninsula has been on our agenda ever since. As soon as we decided to visit South Australia, we plotted it in as our first destination. 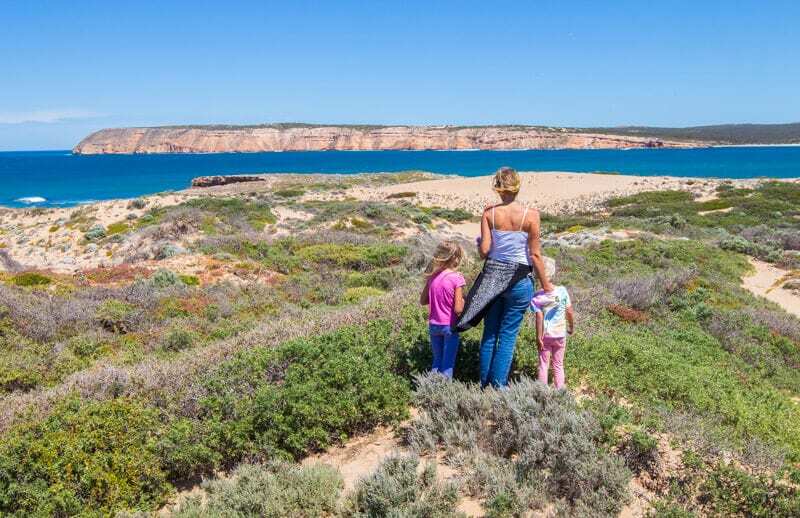 In this post, we’ll outline a possible itinerary you can follow as well as things to do on the Eyre Peninsula. How many nights you stay at each place depends on upon your travel time. 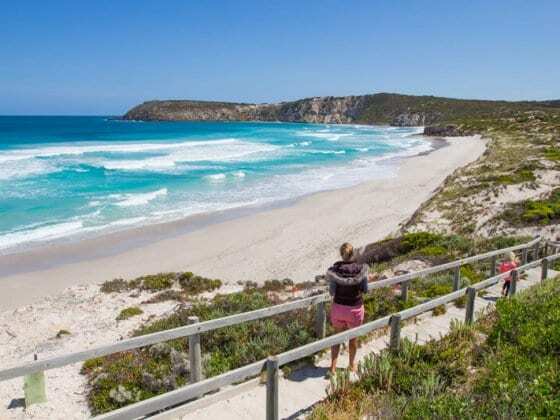 We recommend taking at least a week to explore the Eyre Peninsula. Whyalla was a stop over destination for us to break up the long drive between Adelaide and Port Lincoln. It’s about a six-hour drive from Adelaide, which is short for Australian standards. Our campsite at Discovery Parks was right on the foreshore, so we woke up to beautiful views of the ocean. It was a serene place for me to sit for my morning sun gazing and meditation. Craig walked up to the top of Hummock Hill for sunrise and pretty views over the town. The best experience we had in Whyalla was sunset from the marina. If you’re there when the boats are coming in and out there’s a good chance you’ll see some dolphins following them. The marina is a short 1km walk from the campsite. As you can see from the pictures, sunset is beautiful in Whyalla. About 20 minutes northwest of Whyalla is Point Lowly Lighthouse. It’s worth a drive to see the stunning views of the Gulf framed by the Flinders Ranges. It’s your first glimpse of the brilliant blue waters that make the beaches drop your jaw. 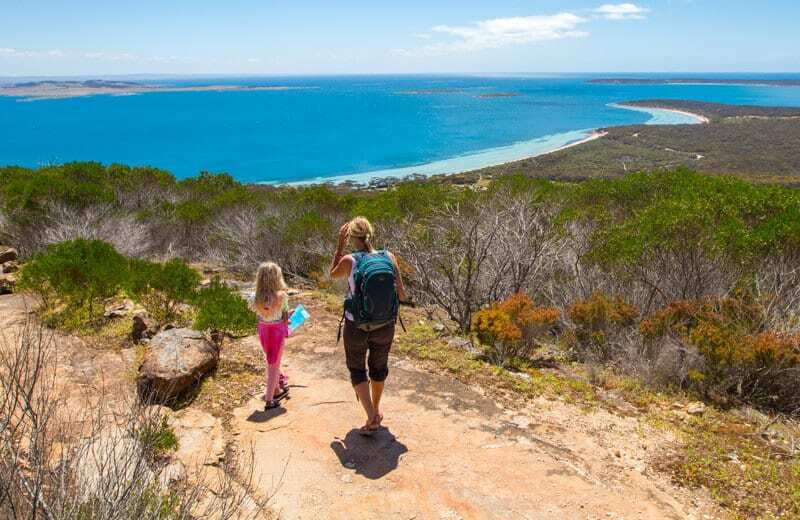 If you have more time, there is the Freycinet Trail, which is suitable for hiking or driving. It follows the coast of Fitzgerald Bay for 12 km. 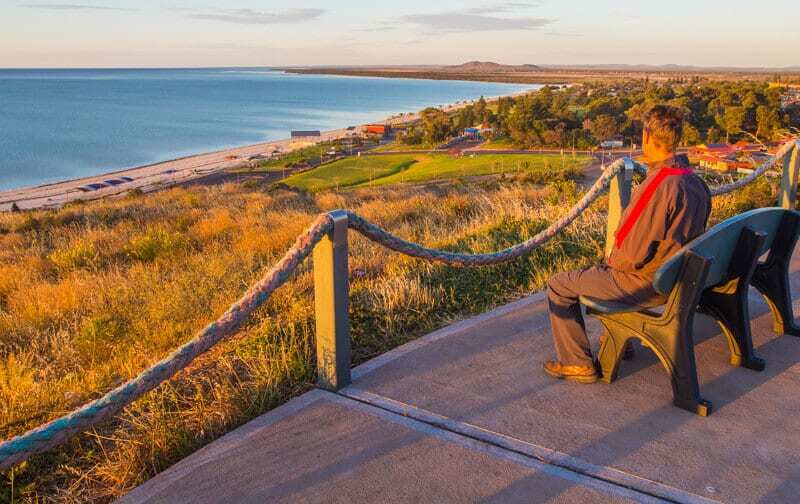 We didn’t get to experience it, but I heard rave reviews about the views from Wild Dog Hill in the Whyalla Conservation Park which is about 30 minutes north-west of Whyalla. Sunrise and sunset are particularly good. 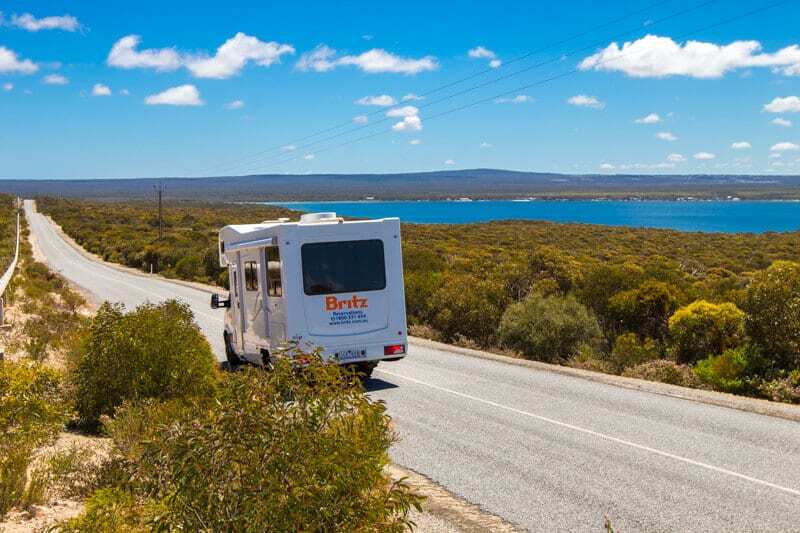 Take your drive down to Port Lincoln slowly. If you have more time, stay at one of the seaside villages for a night or two. We cruised down stopping to check out some of the small fishing villages and white sandy beaches. The most beautiful beach was probably Port Neill. We loved the heritage feel of Cowell, with its beautiful preserved buildings. The drive from Cowell to Port Gibbon is meant to be spectacular. We had glimpses of the ocean from the highway but couldn’t take the scenic coastal drive is it was an unsealed road. Arno Bay and Tumby Bay are also worth a rest stop. The drive from Tumby Bay into Port Lincoln with it’s rolling green hills and hay bales is gorgeous. What a lovely town Port Lincoln is! Port Lincoln is on Boston Bay, one of the largest protected natural harbours in the world and three times the size of Sydney Harbour!! 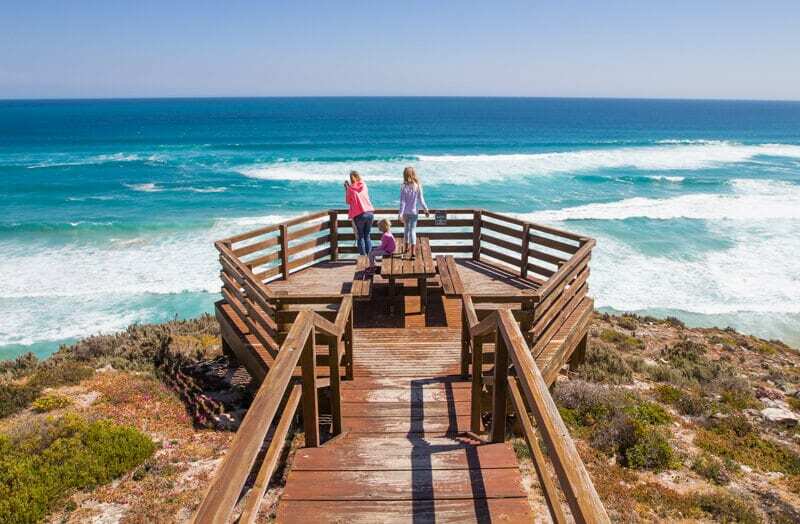 It’s a good lifestyle in Port Lincoln, and it’s one of those towns where the locals are warm and friendly and obviously in love with the region. They’re happy to share their tips and stories on the endless places they have to discover in the region during their free time. In hindsight, we would have planned for more time here. 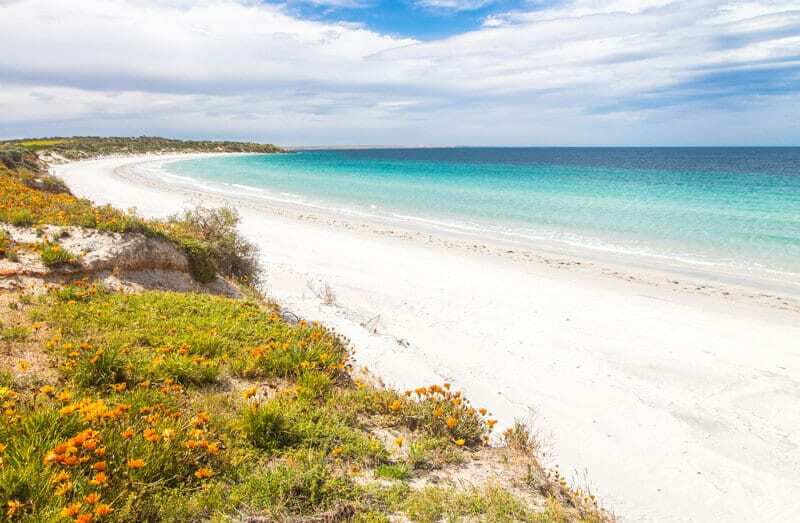 We recommend using Port Lincoln as a base to explore the southern and east coast of the Eyre Peninsula. I shared an email with my Notes on the Road crew (my special tribe that gets my most personal and intimate stories – join us it’s free) that almost two years ago I refused to swim with the sea lions at Baird Bay because I was afraid of sharks. Port Lincoln is the home of cage diving with Great White Sharks so you can guarantee they like the waters around here. This time I enthusiastically dived into the water with the Australian sea lions without a glimmer of shark fear, #I’vechanged. 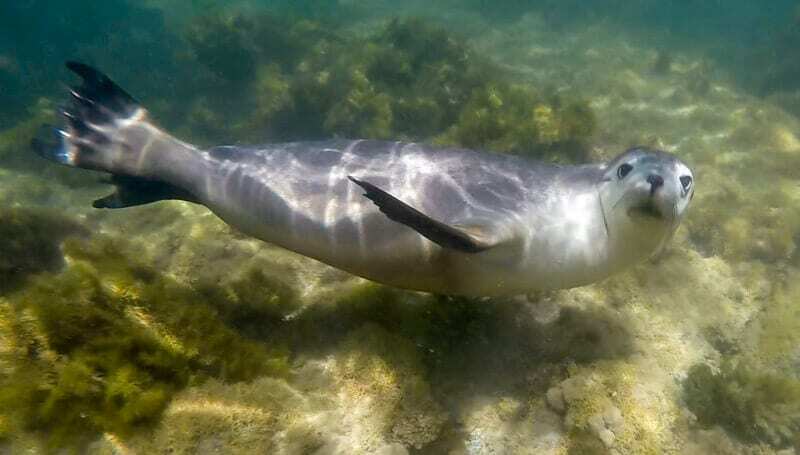 Swimming with the sea lions in Port Lincoln is a completely wild experience, and there are strict rules in place to protect them. As soon as we hopped in the water, the sea lions swam out to greet us, spinning around us underwater and jumping out. The more you move and play the more excited they get. They swim right up to you and stare intently and openly in your face. It’s adorable. Kalyra had a short time with us in the water. She feels the cold intensely and couldn’t put the shivering behind her and so went back to the main boat. Savannah is very cautious by nature and does not like the water. She stood with us in the water for awhile watching them play and swim around her. That was enough for her, and she joined Kalyra, leaving time for us to play with our new friends. The captain took the girls for a little ride in the tender to watch the sea lions on the beach. The water is cold – it is sea lion territory after all, but the crew provides you with thick wetsuits, which make it bearable. The crew from Calypso Star Charters were super friendly and told us many stories about the Port Lincoln area. The hot shower and delicious lunch after our swim were so welcome. Press play to see what the swimming with sea lions experience is like – subscribe to our YouTube channel, so you don’t miss more travel videos. We recommend using a day (or even longer) to explore the Lincoln National Park. There are many off-roads you can explore if you have a 4WD. There are plenty of lookout spots along the way so drive slowly and take in the magnificent views of the harbour, stunning coastline and nearby islands. It’s the place to come if you like hiking, fishing, swimming, 4WDriving, photography and bush camping. It’s truly stunning, and we’ll add it to our best national parks in Australia list. 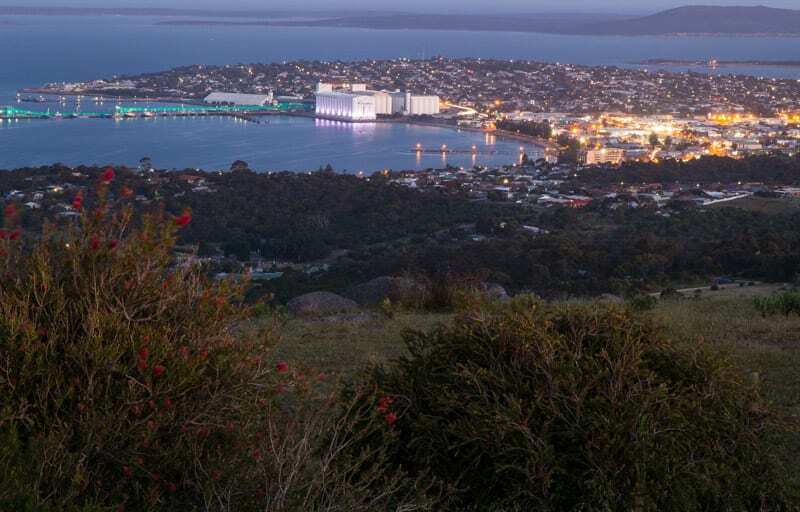 For epic views of Boston Bay, Port Lincoln town and the coastline of the National Park, take the short walk up Stamford Hill. Check out the historic Flinders Monument, built in memory of Matthew Flinders who surveyed the Eyre Peninsula coastline in 1802. Consider taking a head net as the flies were a little pesky when we went. It’s an easy enough walk for kids to enjoy as well. Savannah took her notebook with her to record animals she found along the way, and at the top Savannah and Kalyra created and filmed their own magic show. I love how they manage to entertain, create and teach themselves. At the base of the walk are a couple of lovely beaches worth checking out. The entire coastline in Lincoln National Park is full of them. We were told by a local that Memory Cove was the secret best beach in the region. 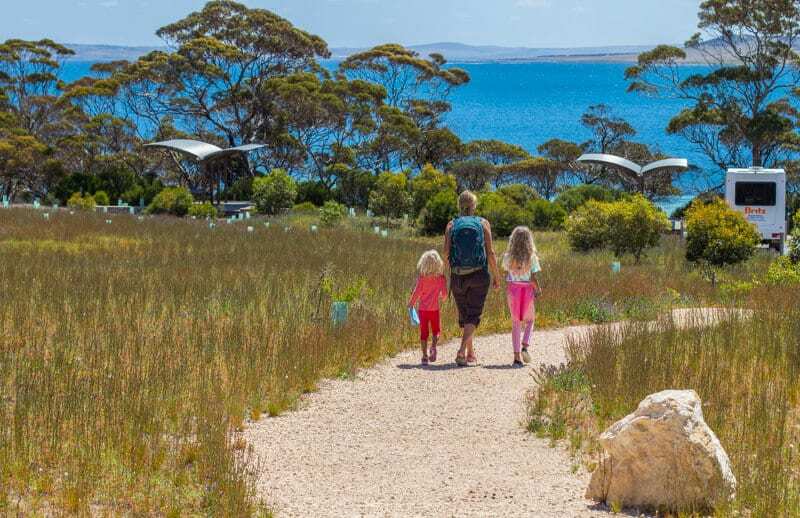 A permit and gate key is required from Port Lincoln Visitor Information Centre. This is to help reduce numbers and preserve the wilderness environment. Sleaford Bay is on the way to Fishery Bay and Whalers Way. It’s worth a detour and a great spot for whale watching during the season. If you have a 4WD, there are sand dunes to visit and slide down. A must is driving out to Fishery Bay. We had a thrill driving out to Fisheries – a kangaroo came bounding beside us to drag race us. You can see it in our upcoming video (or on Instagram here). Boy, can they jump fast! We were driving about 40km/hr, and it managed to stay up with us for a good minute or so. 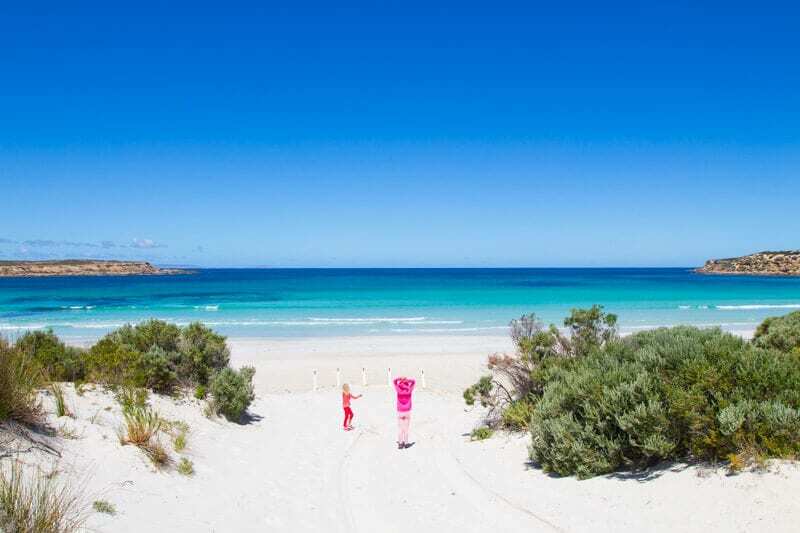 Fishery Bay would easily make our top beaches in Australia list. It’s stunning – powdery white sand that curves around in the bay, crystal clear turquoise water, rolling waves, and not a soul to be seen. Fishery Bay is a surfing beach. As a local told us, it’s also known for it’s Great White Sharks out beyond in the channel. So swim carefully and close to shore. 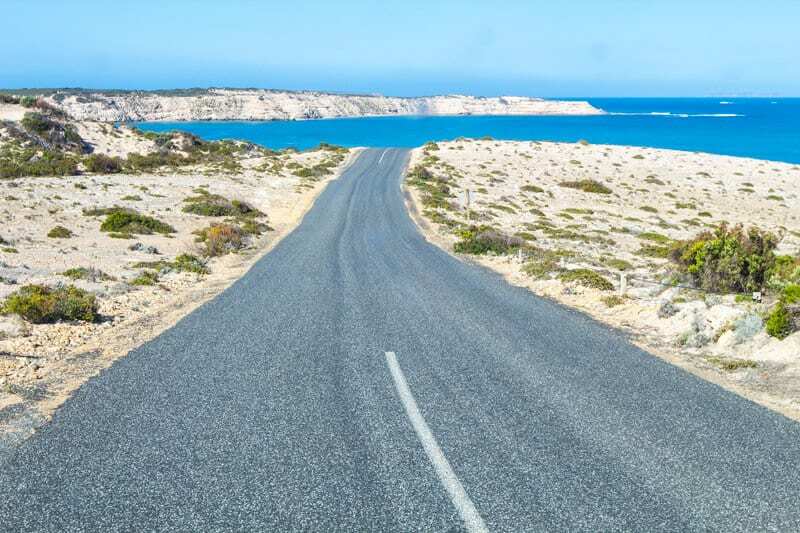 From Fishery Bay you can drive the 14km Whalers Way drive along the southern most tip of the Eyre Peninsula. Featuring cliffs, blowholes, caves, crevasses and golden beaches, Whalers Way is said to have some of the best coastal scenery in Australia. We didn’t get to do it, but it comes highly recommended. Fee: $30.00 per Car. Plus $10 Key hire. Available at the Port Lincoln Visitor Information Centre. We were so tired on our first afternoon in Port Lincoln that we broke our no-coffee-after-midday rule. 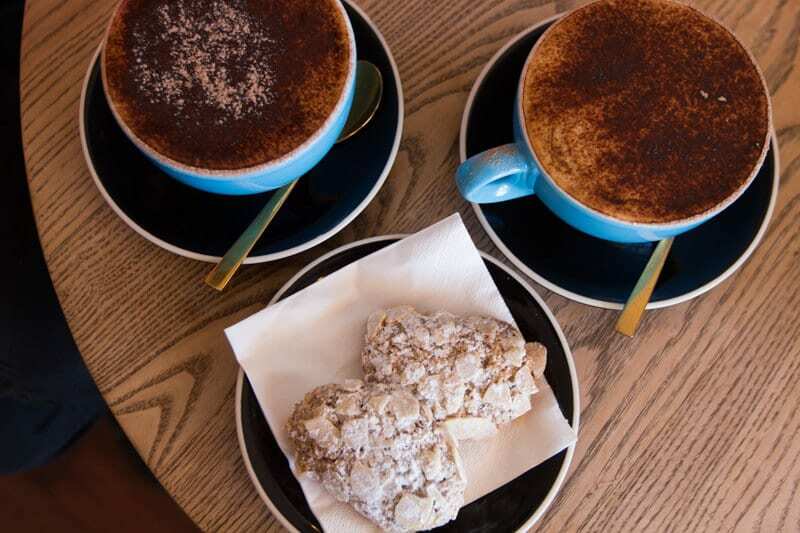 Trip Advisor reviewers told us that The Rogue & Rascal had the best coffee in South Australia!!! It was outstanding, and we returned the next day. The Rogue & Rascal has pretty views out over the Town jetty and the gluten free biscotti’s were also delicious. They had a healthy menu that totally suited my gluten-free, sugar-free, not-coffee-free eating habits. Port Lincoln is full of surprises. We had several people jump out on our Facebook page later to recommend it as the place to go! Put it on your coffee bucket list. 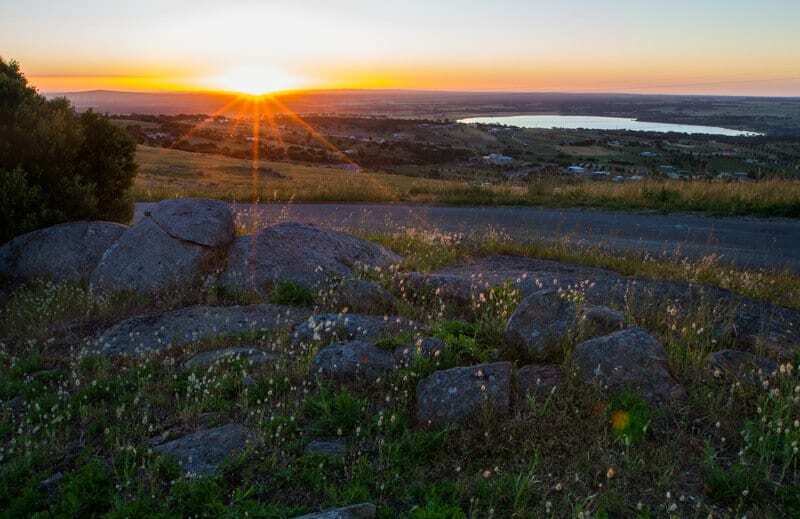 To gain a perspective of the Port Lincoln area drive about five minutes out of town up to Winters Hill Lookout. You’ll get 360-degree views over the harbour, town, and surrounding farmlands. Head up there for sunset so you can see it in daylight, the orange glow of dusk, and twilight when the town lights come on. Grab yourself some fresh local tuna from Sarins – a bargain at $30 a kilo and some fresh local oysters from Port Lincoln Gourmet foods, again a bargain at $8-10 a dozen depending on your size. 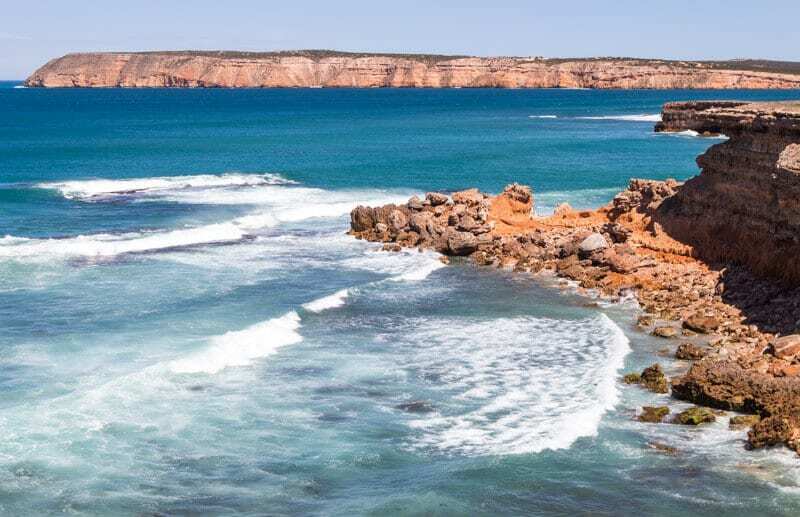 The Eyre Peninsula has some of the best seafood in Australia, and the Port Lincoln region is famous for Bluefin tuna, King George Whiting, and oysters. 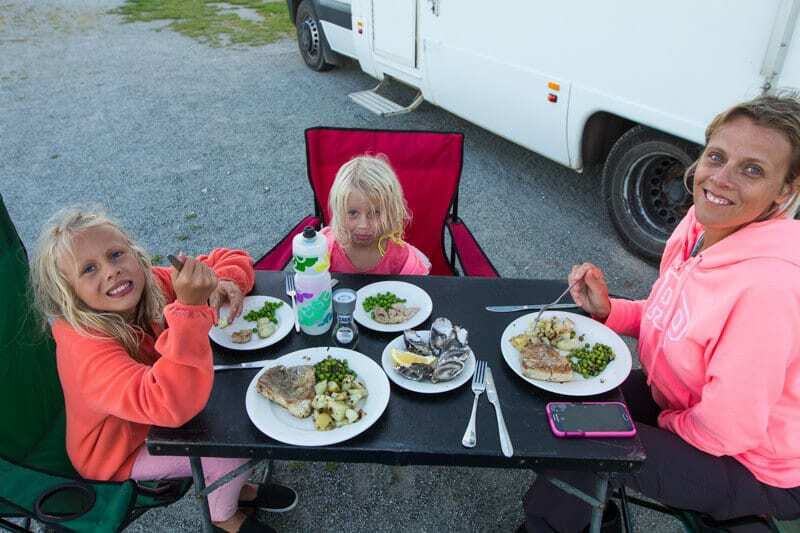 We cooked ours up in our Britz motorhome and enjoyed a meal sitting outside with views of the beautiful harbour. We stayed in Port Lincoln for three nights in the Port Lincoln Tourist Park. 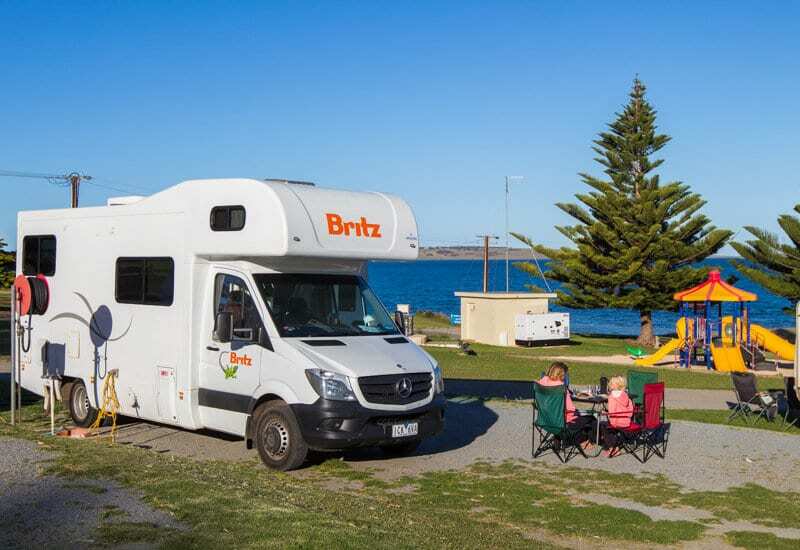 Its position was right on the water with beautiful views across the bay to the National Park and recommend this tourist park as a place to stay in Port Lincoln. We didn’t get a chance to enjoy the Parnkalla Trail which winds its way around the edges of Port Lincoln’s harbour. From the caravan park, you can walk one direction on it into Port Lincoln Town and the other way to Port Lincoln Marina. 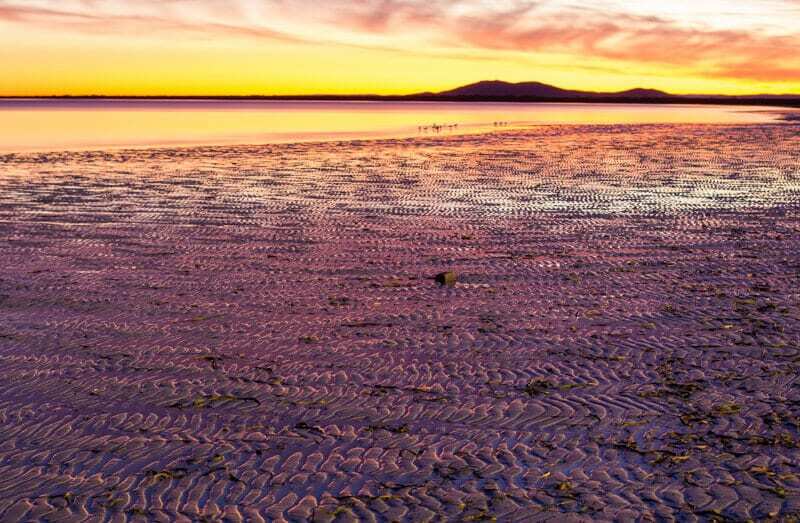 It might sound like a morbid town, but picturesque Coffin Bay is anything but. The town was not named after wooden boxes built for the afterlife, but a friend of explorer, Matthew Flinders. Coffin Bay is famous in Australia for the oysters that grow in its waters. I’m not a devoted oyster lover; I can have one or two, and that’s enough. I could have easily sat down and eaten a dozen of the oysters from Coffin Bay. In fact, we ate a couple dozen during our time in the region. Coffin Bay oysters are outstanding and the best I’ve ever eaten. 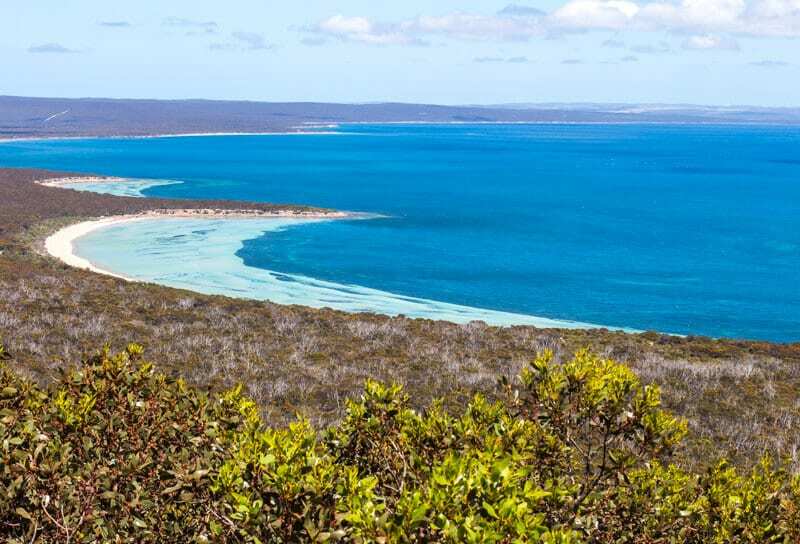 Coffin Bay is only 46km from Port Lincoln so you can easily visit on a day trip. We visited in the morning on the way to Elliston. 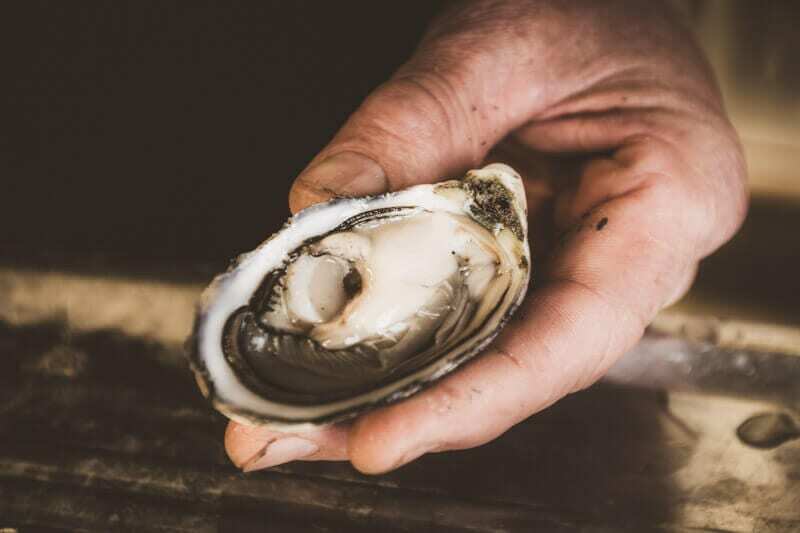 While in Coffin Bay, learn all about the oyster aquaculture on an informative oyster tour at the Pure Coffin Bay Oysters. 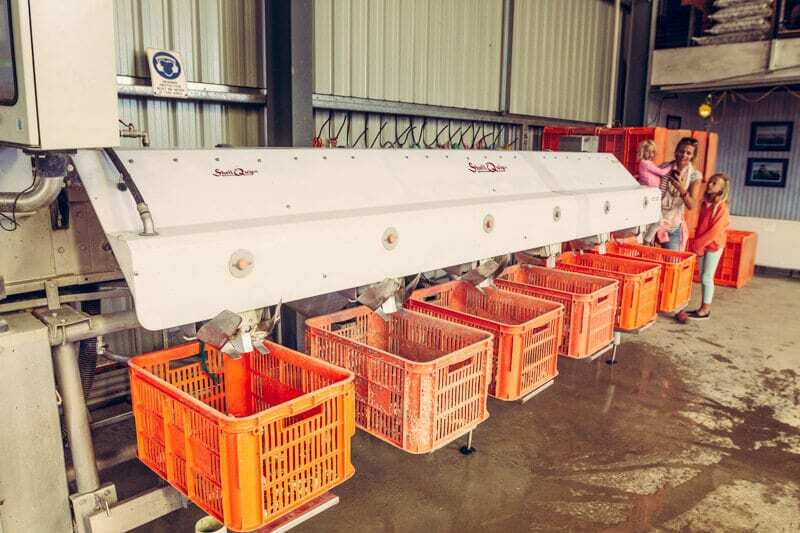 In case you didn’t know, Craig and I once worked on a pearl farm in Western Australia, so I have a high interest in learning more about a similar industry. It sure gives you appreciation to what goes into making the perfect oyster, and you can understand why they are a higher priced luxury item. At the end of the tour, Chris taught us how to shuck an oyster, and gave us a few samples. He has started to reintroduce a native Angasi oyster into the farm These were the original native oysters that started the industry back in 1848. Sadly the oyster collectors back then knew nothing about conservation and wiped them all out. He’s bringing them back, and we sampled one (or maybe two). His apt description of the differences and how you approach eating them is to start with the Pacific Oyster as they are more of a white wine, followed by the more robust and lingering angasi. He was right. I found it an experience like finishing off your meal with a red wine and a plate of mature cheese. I could have stayed there all afternoon. 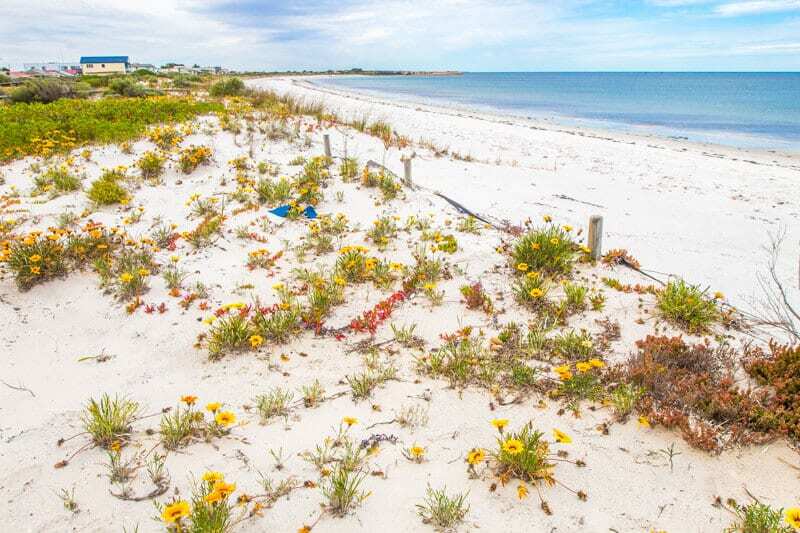 The Coffin Bay Peninsula is covered by coastal dunes and swamps and has a coastline of white beaches and limestone cliffs overlooking reefs and islands. There is plenty for you to see and do in the national park. 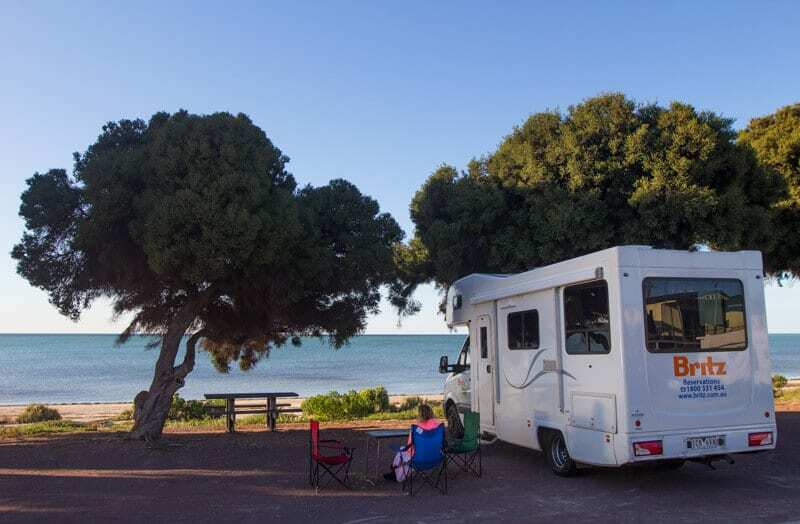 If you have a 4WD, you could spend days exploring and camping in the Coffin Bay National Park. The best parts are found via the 4WD tracks, but there are 2WD roads that take you to some spectacular lookouts and beaches. 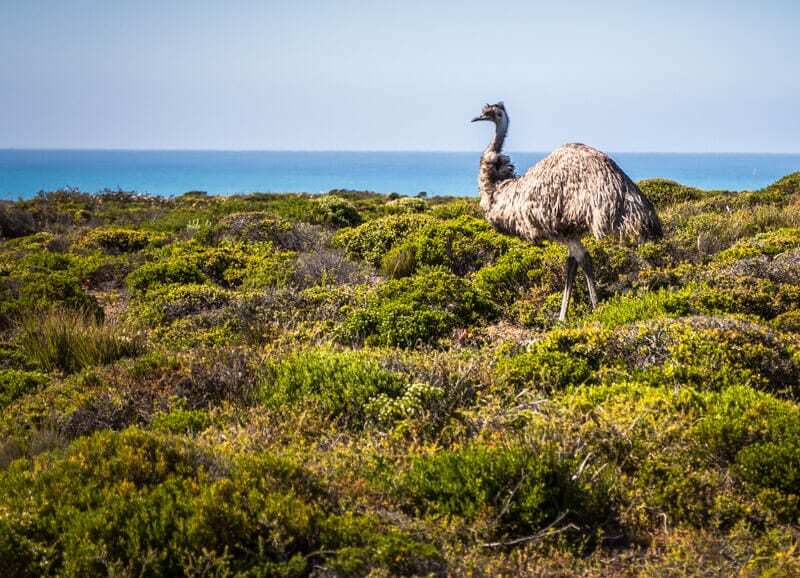 Be prepared to see plenty of emus in this national park. We saw more emus in our two-week visit to South Australia than any other place in the country. Entry is $10 per vehicle per day/ $11 a night per vehicle. 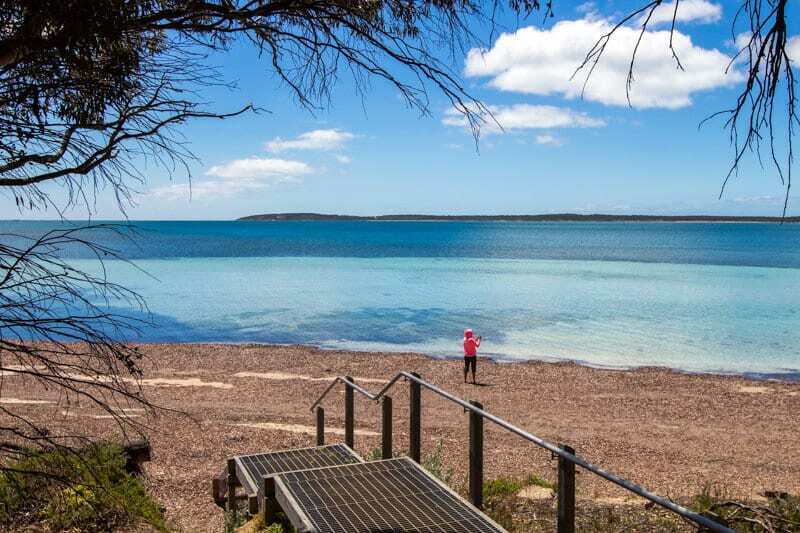 If you want to linger in Coffin Bay longer, there is an 8km walking trail around the foreshore of Kellidie Bay. The calm, pristine waters of the Bay are also great for all kinds of water activities. You can certainly see why oysters grow well here. If you have a 4WD, you might want to take the drive to Elliston a little slower and stop at many of the beaches along the way. I love the 360-degree views here overlooking the rugged cliffs and mountains and then behind the arid, dusty landscape and the nearby salt lake. Gorgeous. It’s worth pulling over for a look and a snap. Dramatic coastline is at Lock Wells. 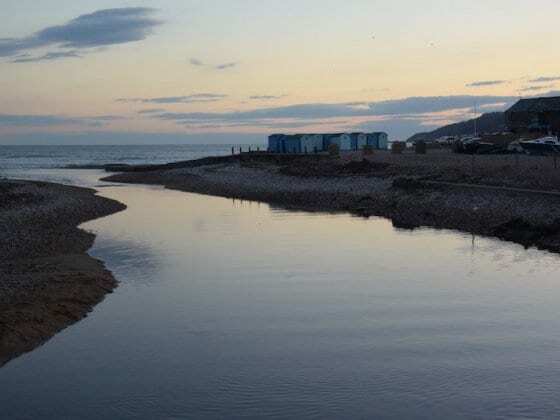 It’s not the place for swimming or surfing, but Locks Wells Beach is meant to be one of the most reliable spots for Australian salmon fishing in South Australia. It’s where the big boys are! There’s a lookout over Locks Wells, or you can walk down the 283 wooden stairs to the beach. It’s also meant to be a good spot for sunset. Elliston is a peaceful seaside town on Waterloo Bay, with tranquil waters perfect for fisherman, snorkeling, and safe swimming. The beaches on either side of the bay are wild and rugged. 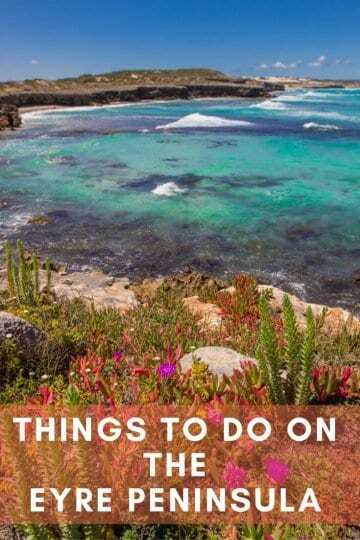 Elliston is the kind of place you could chill awhile and the perfect base to explore the west coast of the Eyre Peninsula. It reminded me a lot of the small coastal towns in Western Australia that entrance you. 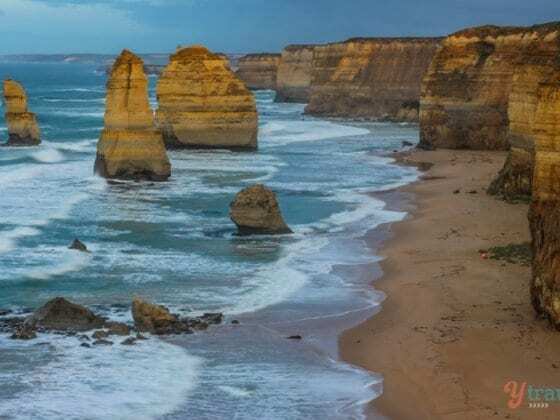 Said to rival the Great Ocean Road, this 12-kilometre loop drive takes in spectacular coastal scenery from Waterloo to Anxious Bay. I’m not quite sure why it’s called Anxious Bay as I felt pretty calm and in awe when we arrived and saw the colour of the water. Along the cliff face are giant permanent sculptures making the drive and your photographs all the more interesting. 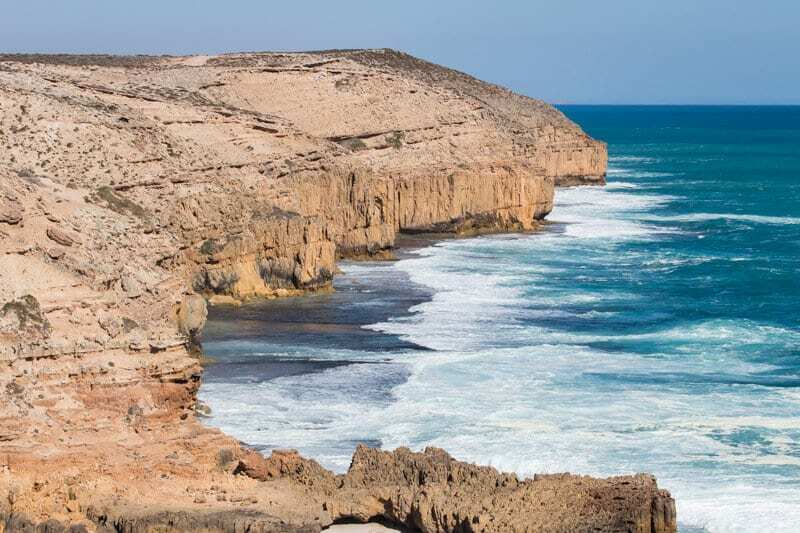 Take it slow and enjoy the views of the rugged cliffs that form part of the Great Australian Bight. Start from the most northern point at Anxious Bay and drive backward into Waterloo Bay, finishing with views at Salmon Point over the Bay and Elliston. We recommend stopping at Blackfellows Point to watch the surfers. When we pulled up there was one surfer dude standing with half a board and two more climbing back up the cliff face after a session. They were the last of the surfers tackling the wild and rolling sets. I’ve never heard of it before, but apparently Blackfellows is one of Australia’s best surfing breaks. I’d much rather be the group of guys on the cliff face watching with beers in hand. I’d much rather be the group of guys on the cliff face watching with beers in hand. We heard several times that the sunsets in Elliston were pretty special. Grab a spot anywhere on the beach and have it practically all to yourself. The sun sets behind an island that looks like Uluru and a couple of smaller ones beside it that look like sailboats. When the sun sets, it sends a ring of fire around the island and reminded me so much of an Uluru sunset. It’s the Uluru of the Sea. We stayed one evening at the Elliston Waterloo Bay Tourist Park. It’s in a perfect position on the beach and a short walk into town, and the owners were super friendly. On the way to Venus Bay, if you have a 4WD, check out Lake Newland Conservation Park. With its rolling white sand dunes and wetland area, it looked pretty special from the highway. 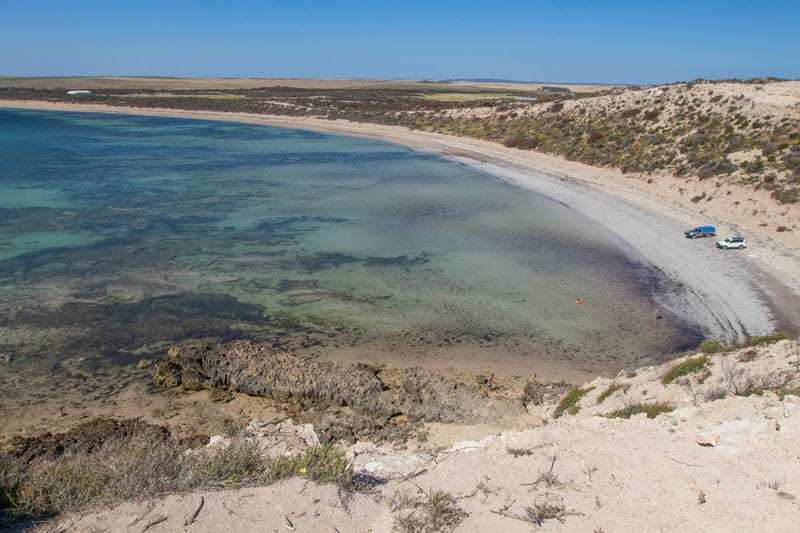 If you love fishing, then the Eyre Peninsula will be your paradise. 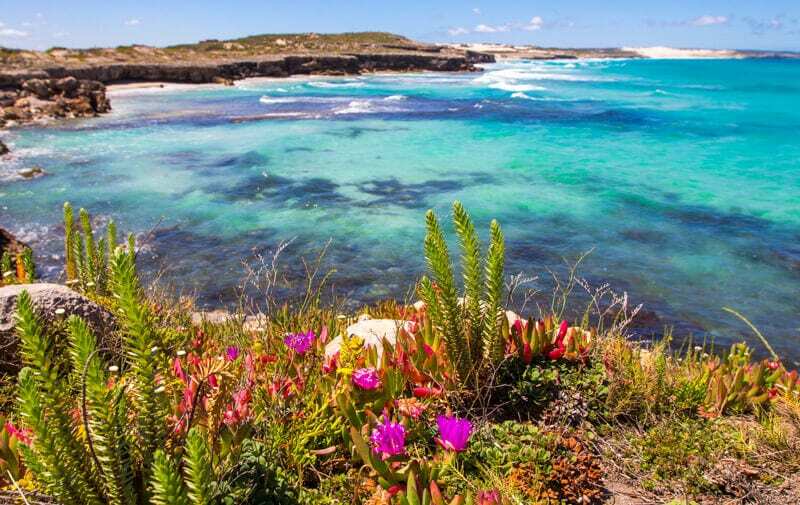 Venus Bay is another small seaside village good for fishing and all kinds of water activities. Just south of Venus Bay is Camel Beach and the popular Talia Cave Tourist Drive – we couldn’t get to them in our vehicle. The Tub and Woolshed are said to be two beautiful caves and caverns to explore. 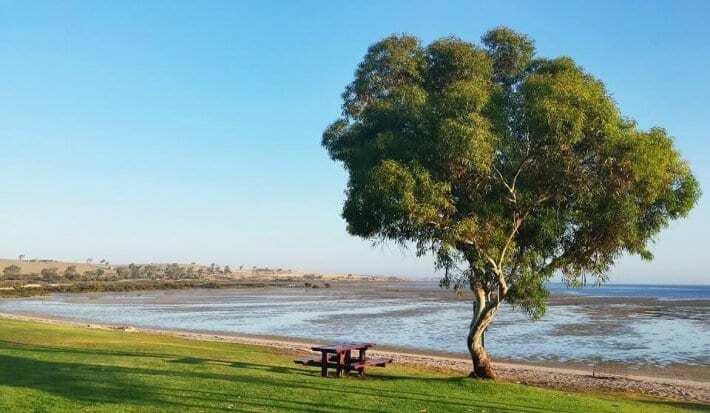 We did not visit Streaky Bay on this trip, but we did at the end of our great Australian road trip. It’s a gorgeous little town, and the nearby area is stunning to explore. 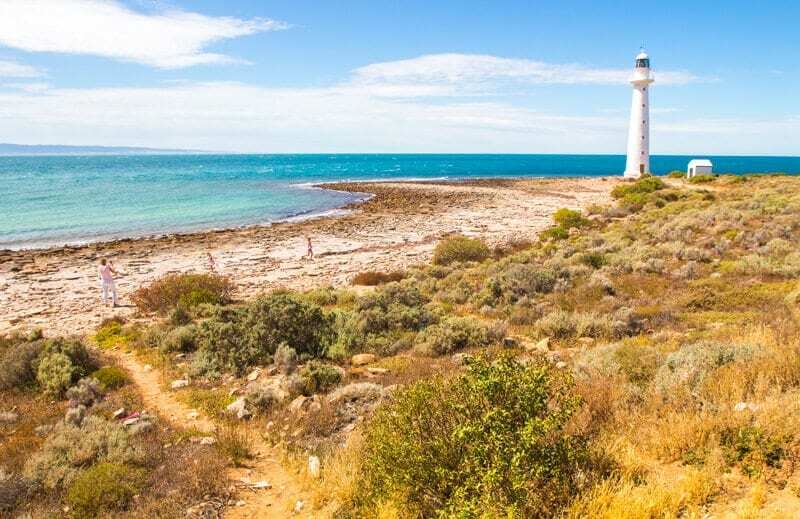 When you visit Eyre Peninsula, you’ll soon discover Matthew Flinders was a pretty important man in this region. He explored and discovered most of it back in the early 1800’s fact check. 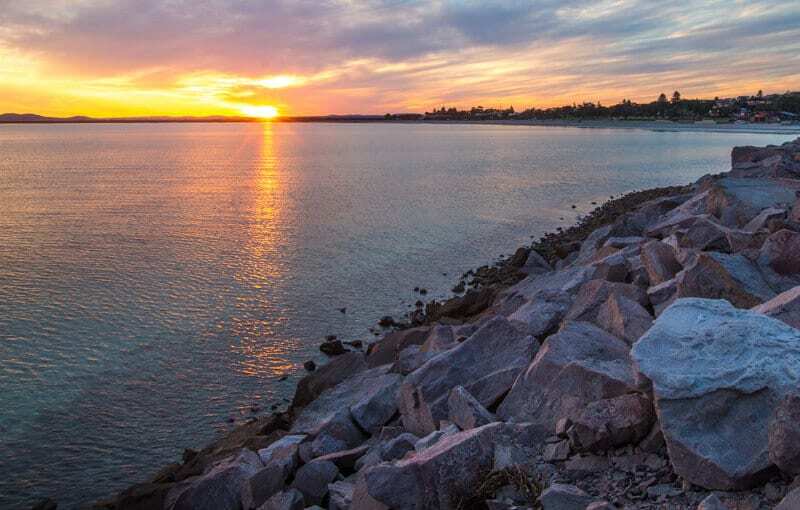 Enjoy the coastal scenery on the drive down to Point Labatt. Point Labatt is home to the only permanent colony of sea lions on the Australian mainland. You can watch them frolicking on the beach and under the cliff face from the lookout. 10km south of Streaky Bay is the 10m Westwall loop. 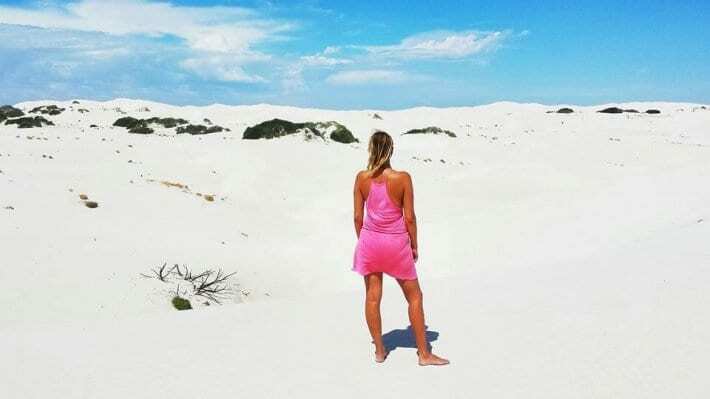 There are spectacular views of the Southern Ocean, surfing beaches and the girls loved playing in the Yanerbie sand dunes. Murphy’s Haystacks are a unique outcrop of pink granite boulders about 40km southeast of Streaky Bay, and I’m baffled as to how we missed these when we were there. 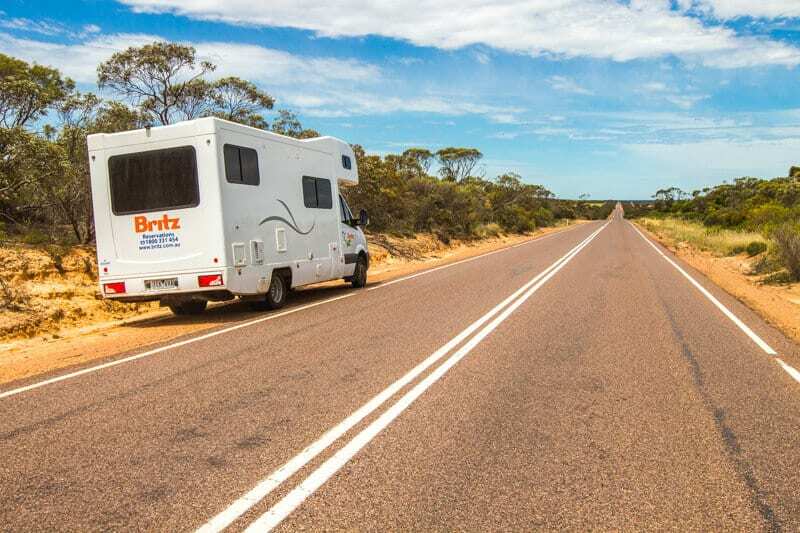 We cruised around the Eyre Peninsula in our mobile home, a 6-berth motorhome, hosted by Britz. We enjoyed our motorhome, especially the girls. We’ll have a post coming soon sharing our thoughts on the motorhome experience. There were a few spots we couldn’t get to due to unsealed roads. It wasn’t too many, and it didn’t impact our trip too much, especially given the short time we had. But, consider this with your planning. 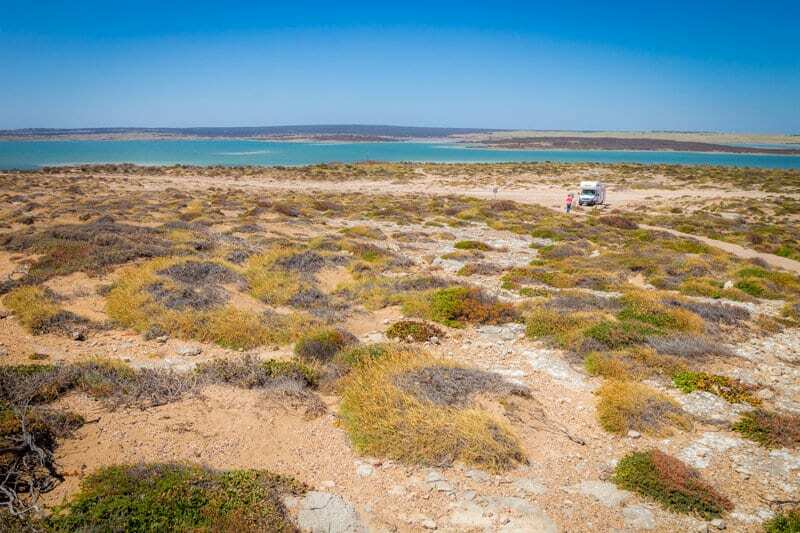 Another option is to rent a 4WD to explore the Eyre Peninsula. 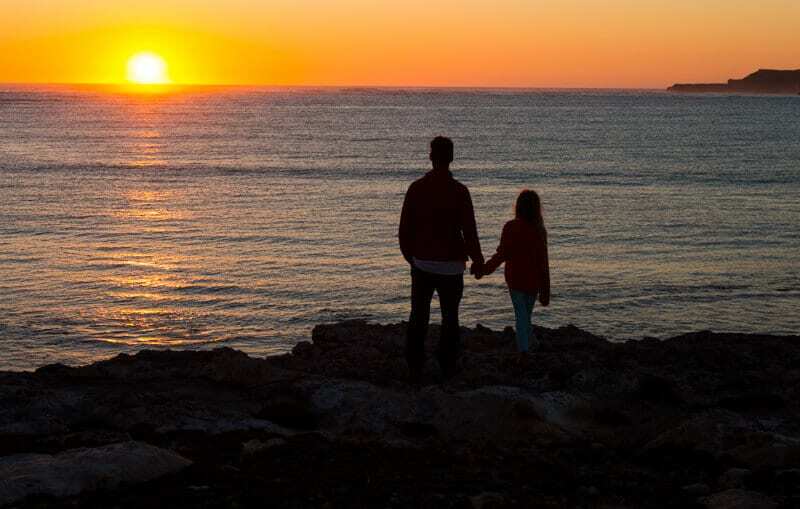 What tips can you add for things to do on the Eyre Peninsula? 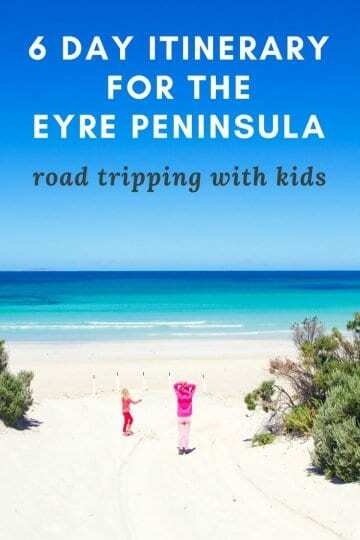 As you know the Eyre Peninsula was one of the highlights of our trip around Australia. Thank you for bringing it all back to with your gorgeous photos. There are a few places you visited that we didn’t so it could just mean we need to go back! 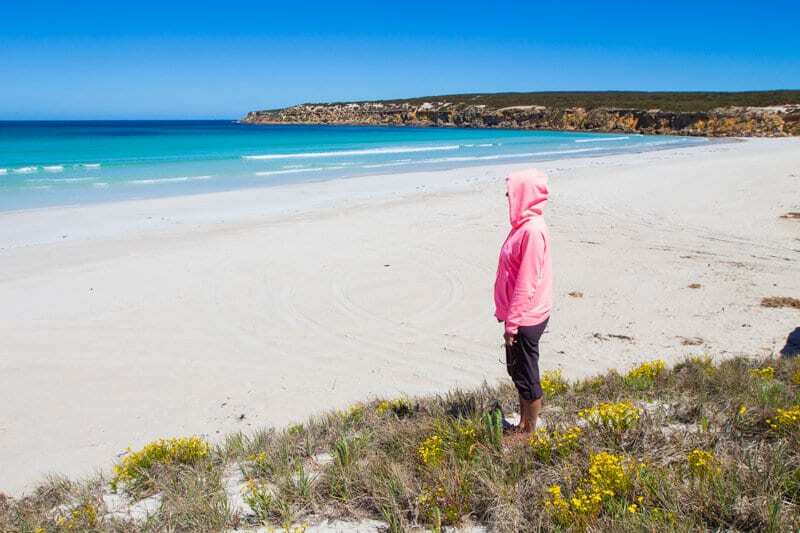 I know Kathy, there are so many great things to do in Eyre Peninsula. Happy to hear we’ve inspired a return visit for you! Dazzling photography.Peninsula is the wonderful place,i like your blog so much,thanks for sharing it.Venus Bay look very nice in your photos. Thank you for bringing it all back to with your gorgeous photos!